PEST CONTROLHouse Spiders are arachnids, not insects. Spiders don’t bite people very often. There is a belief that spiders come into your bed and bite you during the night and they all use webs. Not all spiders spin these silk structures to catch their prey. In fact, several species of spiders use different strategies for obtaining food. 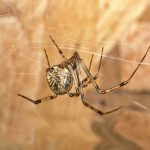 Diet: House spiders will try and catch a variety of insects such as flies. Habitat: The house spider randomly selects its web locations and creates a tangled web. If a web does not yield prey it is abandoned, another site is selected, and a new web is built. House spiders have a difficult time surviving in modern homes due to low humidity and fewer insects for food. They are more likely to prosper inside structures like garages, sheds, barns and warehouses. Outside, these domestic spiders are often around windows and under eaves, especially near light sources that attract prey. Impact: Common house spiders are nuisance pests, but they pose no threats to humans.